Factual error: Lauda is an Austrian. Yet when his name appears on scoreboards with his country abbreviation, it shows AUS, which is for Australia. AUT is for Austria. Continuity mistake: When Lauda is going out from his pitstop he is blocked by Andretti's Lotus, but after the pitstop he overtakes Andretti on the track. Factual error: When James Hunt is in the rain, he has raindrops on his visor. At that speed, no drops can stay on anything. And besides that, most water will go over his head. A few drops might hit his helmet. Other mistake: The Rolls-Royce at Watkins Glen, and the Mini in England, have the same English license plate. Niki Lauda: A wise man can learn more from his enemies than a fool from his friends. The Formula 1 cars you see in this film are Formula 3 vehicles with fake F1 bodywork. 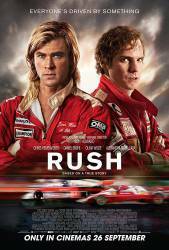 They were used because Daniel Bruhl and Chris Hemsworth were not allowed to drive real Formula 1 cars.